35 Years of Combined Experience! Arizona Roof Rescue is comprised of professional roofers with over 35 years of combined Arizona roofing experience. We are a family owned and operated business that is fully licensed, bonded and insured, and members of the Better Business Bureau. Each of our employees are NATE certified roofing technicians with years of professional roofing experience. Customer service is our first priority, and all work is done with a quality guarantee to ensure 100% satisfaction with your Arizona roof. We complete all of our roofing projects quickly, neatly, and safely. Providing our customers the roof they desire in a timely and safe manor. We provide an extensive gallery of before and after photos that showcase our level and quality of craftsmanship, and testimonials are available which reflect on our commitment to service and quality. Our Arizona roofing contractors have years of experience with roof repairs, replacements, re-roofing and more throughout the entire valley, and are ready to help you with your roofing needs. Arizona Roof Rescue can replace an existing roof, install a new tile roof as part of a home addition, repair storm damage and help with insurance paperwork, inspection and cleanup. Our roofing contractors use quality materials including asphalt, wood shingles, tar shingles, tile roofing, or natural slate to ensure satisfaction in your roofing system that will keep your Arizona home leak free for years. 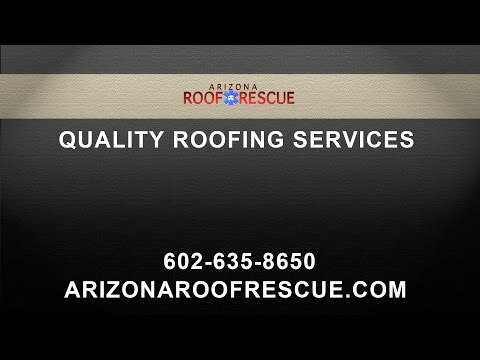 If you are looking for a professional Arizona roofing company that you can trust to maintain, repair, or replace your local roof at an affordable price, with a quality assurance guarantee, look no further than Arizona Roof Rescue. Call for a free estimate and consultation, and speak with a roofing expert that can help you to determine which roofing materials suit your needs based on location, weather, and price range today. Together we can begin saving you money and protecting your home from local weather and temperatures.